चिराग तले अँधेरा क्यों होता है? और जब बात जलने की होती है तो मुझे अपने एक शिक्षक की बात याद आ जाती है जो कि उन्होंने हम लोगों से लगभग एक दशक पहले कही थी कि अंतिम विजय ही विजय होती है। मैं उनकी पंक्तियों को ही उद्धृत कर देता हूँ, "एक बात हमेशा याद रखना कि जलते दोनों हैं। जलते दोनों हैं मगर एक जल कर बुझता है और एक बुझकर जलता है। लेकिन दुनिया उसे ही याद रखती है जो बुझकर जलता है।"
Nobel Laureate and a popular face of the Austrian school of economics, Friedrich A. Hayek's legendary work 'Road to Serfdom' was a monumental piece against the socialist and communist movements of the world and against the growing government control over the businesses - big and small. This book is a strong critic of collectivist thought, but we have to see it in the light of the time when it was written. The book was written post World War 2 when the world has seen the dictatorial National-Socialist regime of Germany under Hitler or communist rule in USSR under Stalin. Hayek, a classic liberalist, to be distinguished from those who believe that democracy can survive in a full-fledged socialist state, warned the world of the dangers of excessive, and in some cases absolute, government control. He was praised by later day successful free-market champion governments which brought sweeping reforms like that of Margaret Thatcher. Hayek lived long enough to see his theory turning true in some countries and some other taking corrective steps. 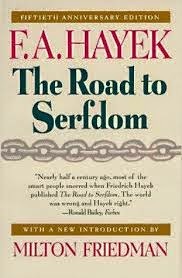 In initial few chapters of the book, Hayek argues against economic planning, till then existing in the form of Five Years Plans of Soviet rule and many other states pitching for central planning. Hayek's opposition to centralised planning was based on two reasons. First, that the centralised planning is too big a task to be executed efficiently by any authority. Any authority cannot decide for all sectors of industry keeping in mind the welfare of all sectors. It is bound to promote interests of a group or an industry and in the process neglecting all others. Thus effectively driving out entrepreneurship from the state because people will have to follow what planning authority have decided for them instead of acting as per the requirements of the market. The second point that Hayek raises against planning is that it creates too powerful a structure against which public can hardly go. This is logical also because whatever planning authority has decided is to be implemented and if someone does not accept the decision taken for him, then force has to be used. This force is what leads to totalitarian regimes. He cites the example of the right to acquire land which was not given in communist regime of USSR. Hayek says that in that case an individual is always at the mercy of the state. There is no incentive to work. Also in a collectivist rule, a person cannot choose his field of interest as his way of livelihood earning. Hayek says that although the chances of a very poor becoming a very rich person in a free market economy are very less but that there is a chance is no mean achievement in itself. In a collectivist state only those favoured by people higher up in administration and hand-picked by them can become part of the influential class. Hayek also argues against the notion of security that a collectivist state is thought to offer. Consider a case where a person has acquired a skill by hard work over the years and then a scientific innovation leaves his skill redundant or a natural calamity roots out an already set up business or industry. Although humanitarian side says that government should come to the rescue of the concerned individuals but Hayek advises against that. He says that job security provided to an individual is a loss for others. For another person whose skill was rendered unrequired after an innovation and who now masters a new art for the living is inherently at a loss and that too because he adjusted to changed scenario. He also says that a situation of complete job security does not let an individual to give his best and hampers innovation. In one of the chapters, it is discussed how dictators rise from the society. Hayek says that initially that leader has a small following who see their benefit in the rise of that leader. With this set of followers, the leader cannot rise to the top, so they require an issue to get a mass following. Most of the time this issue is emotional one like the humiliating defeat of Germany in First World War and consequent signing of pacts which added to humiliation was used by Hitler to further National-Socialist rule in Germany. When the leader has a mass following and acquires authority, he will enact laws and create authorities to curtail individual freedom necessary for his unchallenged rule and survival of regime becomes the most important task of leader who by now has become a dictator because he cannot tolerate a single voice of dissent. Many issues raised in this book may seem trivial because the world has moved since then and most of the communist and socialist regimes have fallen since this book was written and at many points this book becomes monotonous but we have to keep in mind that this book was written in 1945 when the danger of collectivist takeover of the economies was real. Hayek also emphasized the role of government in ensuring competition in the market like governments have to check predatory marketing, and also ensuring that competition does not affect the sustainability of the ecosystem. What Hayek could not see was that whenever a powerful authority is created, it will curtail individual freedom irrespective of whether that authority was created by cronyism or collectivism. When a seasoned politician writes his autobiography, it is like a treasure trove. If he is writing it well before assuming a highly significant office, then he does not have to worry about the fallouts of his writings. An example can be given of the Barak Obama's autobiography, which he wrote in the early 1990s. When a politician writes an autobiography before retirement or when he is still in a race for a high office, then most of the time he is trying to make a statement. His writings are more concerned with image creation and also rectifying or diluting the effects of the mistakes committed in past. 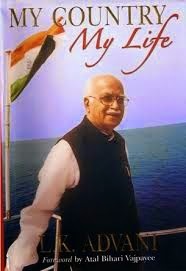 Advani's autobiography My Country My Life falls into the second category. He may choose to speak in detail on few topics and avoid others, still it gives an account of his close encounter with events which changed the course of Indian politics. Lal Krishna Advani was Home Minister and Deputy Prime Minister during Vajpayee government. He was also the president of a national political party of India. The book is divided into five parts. Advani was born in the city of Karachi in Sindh in undivided India. The pain of partition runs deep through the community which was rendered homeless and has to cross the border to make new homes, as evident from Advani's account of the prevailing conditions of partition period. He devotes the first phase of the book to his upbringing in Karachi and how his family migrated to Kutch district in Gujarat. In the second phase, he describes his stint as Pracharak of Rashtriya Swayamsevak Sangh in Rajasthan state. He came closer to the politicians like Shyama Prasad Mookerjee, Pandit Deendayal Upadhyaya and also Atal Bihari Vajpayee. Later on, he would become friends and colleague with Vajpayee, a relation which is alive even today surviving more than six decades. In the third part, Advani describes the situation during Nehru's and Indira's India till emergency (1975-77) and his role in it. He migrated to Delhi and started working as a journalist for The Organiser. He was elected to Delhi Metropolitan Council and became the speaker of the house. Later on, he entered Rajya Sabha to began his long Parliamentary Career. He was chosen to lead Bharatiya Jana Sangh (the predecessor of Bharatiya Janta Party, BJP) which made him rise to prominence in national politics. The fourth part describes the years as the President of BJP when he spearheaded the Mandir Movement. These were the years which redefined the Indian politics. The strength of BJP increased manifold and it formed its own government at Centre and he became Home Minister, the stint which he describes in the fourth part. His tenure as the Home Minister was a very happening one. He talks in detail about the Naxalite challenge, the separatist movement in North-East India, cross-border terrorism in Kashmir, the failure of Vajpayee-Musharraf Summit in Agra and the setting up of a committee to review the working of the Indian Constitution. He makes efforts to explain the events of Gujarat riots and gives incidents of his efforts as Home Minister. During a visit to Pakistan, he praised Jinnah which was not well received in India. He also explains his position regarding Jinnah giving historical instances. Overall the book is easy to read. For those interested in political history, this will be interesting. But to read views of only one side is not recommended. One should read counter views too before forming an opinion on any issue, more so on political issues. Also, read this book for a life account of a refugee who left his home and then gradually rose through ranks to hold one of the highest offices in the Central Government.